Chemistry tuition resources for high school level. Be that GCSE, iGCSE, A Level or SAT. A couple of Welsh children, the animated curious cat, Fur Elise by Beethoven, blast furnaces, biscuit tins, 3rd year undergraduates, iron ore and GCSE Chemistry. What’s all this about? And how can this help with your Chemistry revision? There are some superb educational videos out there that I use for my tutoring resources when tutoring Science online, and this one linked below is one of my absolute favourites! How are biscuit tins made? The extraction of iron from iron ore in a blast furnace followed by its conversion into steel is a well known process in the industrial world. And what better way to appreciate this than to see for real how this process happens? This video comes in very handy to me when I am tutoring GCSE Chemistry online. In particular the C1 and C2 modules for AQA Science. Also for the iGCSE Edexcel Chemistry syllabus. But this video, which is made for primary school children is very versatile indeed. I first used this with a Materials Engineering undergraduate in his third year when we were doing rolling mill calculations for hot steel slabs. The calculations were very complex and at times I felt that we were losing track of what the point of the calculations were. 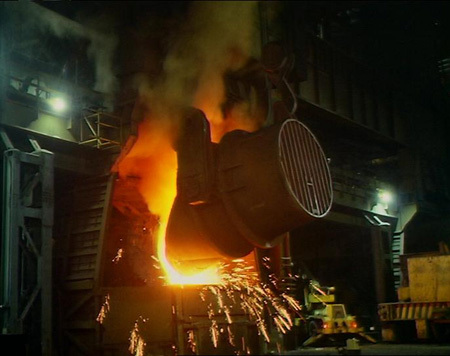 So as always I found a video of the whole steel plate manufacturing process, starting from iron ore, going to the blast iron furnace, then going to the blast oxygen furnace, hot rolling of slabs, cold rolling of slabs, to eventually making the tins. A couple of Welsh children ask the curios cat in this video on how biscuit tins are made. They are transported to a journey where they steel plants and tin factories. So click on the link above and get transported yourself. The music is very good too, especially at the end with Beethoven’s Fur Elise. This entry was posted in Chemistry Tuition Resources and tagged bbc bitesize, gcse chemistry extraction of iron, how are biscuit tins made, making steel on May 7, 2017 by Atul Rana.